Wagon Wheel Information, Wagon Wheel History! Wagon Wheels, especially an American Made Wagon Wheel is made like no other wood wagon wheel in the world. While everyone knows what a wagon wheel is, most people do not know how they are make and how they became to be made the way they are. There is no doubt that the invention of the wheel is one of the most important inventions in history. The reason you do not see a flood of wagon wheels from China into the America market is because there has never been a machine made that can build an American type Wagon Wheel, it is a labor intensive project and most of the time the person building the wagon wheel is an artesian. To view our complete selection of Wagon Wheels, Click Here! In 1892, M.T. Richardson did a two volume work entitled Practical Carriage Building. This two volume work is perhaps the most complete and accurate contemporary work on the subject, even today. I know that I like to quote Mr. Richardson from time to time. Not a lot has changed in the making of wagon wheels in the past 120 years since Richardson wrote this, we still build Yesterdays Handmade Wagon Wheels, Handmade in the USA Today. We have included a part of Richardson's information on Wagon Wheel Making so that our customers might understand some of the process and expertise that is needed to build their wagon wheels. "I fully believe that a first-class wheel can be produced only by the most judicious exercise of mechanical skill. It is the combination of seemingly simple and trifling things which makes all the difference between a good and a bad wheel. But nevertheless it is a well known fact that many poor wheels are made. I will go further and say that a good wagon wheel cannot be made unless the timber of which it is constructed is first-class. No amount of good workmanship can make amends for the lack of good material. It is no exaggeration to say that there are many more poor wagon wheels than good ones. Most wagon smiths know that all wheelwrights are not masters of their trade. Of what good is a vehicle if its wheels are defective? There is a well-known and trite saying, "No wheels no wagon." The first wheels were solid pieces of wood, heavy, hard to make round and would wobble. 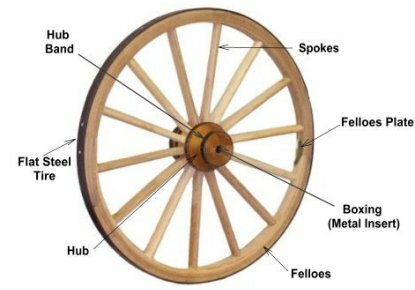 The first known spoke wheels which was much lighter wheel, easier to make round and to control the wobble was around 2000 BC, it was a thousand years before an iron tire would be added to the spoke wheel. There has not been a lot of progress made in the making of wagon wheels over the years. True, with power tools and equipment we can now build the parts quicker that when the parts had to be made by hand. However, we make wagon wheels today basically the same way wagon wheels were made 150 years ago, the only difference is today we do not use a draw knife to make the spokes; we turn them on a lathe. There are a few more modern methods we use today in making wheels; however, we have tools in our shop that are over 100 years old. A real American Wagon Wheel is made from Hickory Wood; there are some companies that build their wheels with Oak or Ash. However, Hickory is the hardest wood grown in North America and the best wood to build a functional working wagon wheel. The hub of the American Wagon Wheel should be made from Ash, if a wood hub, which is also an American Hard Wood, however, less hard than Hickory which keeps the hub from splitting. The second most important factor in building the wheel is that the wheel must be round so that it rolls properly andtrue, that depends on the Wheelwright and the wood that is used. No matter how good the Wheelwright is, the wood that is used to make the wagon wheel must be the best, must be seasoned and must have a low moisture content, we try to get our wood between 10 – 15% moisture content for our wheels and we use only the best grades of wood available to us. If properly seasoned timber with low moisture content is not used over a period of time the wagon wheel parts will shrink and the wagon wheel will fall apart. One of the most important factors in making a good wagon wheel is a properly trained Wheelwright. You can’t be flipping burgers this week and be a Wheelwright next week, it takes years to master the knowledge needed being a cross between a carpenter and a blacksmith. Math skills and precise measuring skills are a major requirement for a Wheelwright. the wood is too thick to be steamed bent and must be cut which can mean as many as six – eight different cut parts to make the complete felloes. The felloes also hold one end of the spokes in place on the outside of the wheel. Most all carriage wheels, cannon wheels and wagon wheels have been dished, one of the main reasons the wheel is dished for strength. Dished wheels were invented by the Romans, from Egyptian time's war chariots were built with flat wheels or straight wheels; while this type of wheel was great for fast speed making a turn with this type of wheel was not good. If you made a turn with a straight wheel at high speeds it would put pressure on the hub and the wheel would fail. The only way to make a safe turn with the flat or straight wheels was to slow the chariot down to almost a stop in order to make a turn, however, not very efficient. The Romans were superior engineers and knew that coming to a stop to make a turn was not the way to win a war. 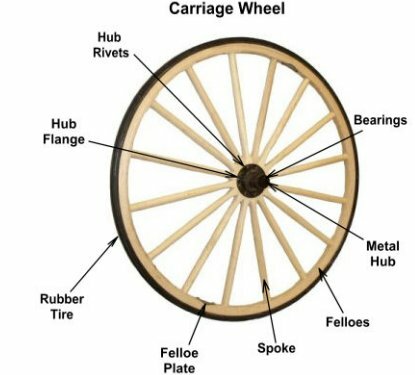 The Romans figured out that putting an iron tire on the wheel while it was hot and let it cool down would pull the wheel together and dish the wheel or cause the center of the hub to be off center not straight. With the wheel dished, it caused the hub to be braced by the spokes unlike the spokes in a straight wheel, the dish would offset the force that would be generated in a turn at a high speed and would allow war chariots to be more efficient. Wagon wheels for the most part have been made that way until the twentieth century. 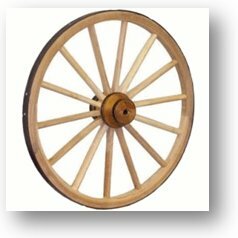 You can view all the information on the wood wagon wheels we make and the wooden wagon wheels we have for sale at our Online Store. Enjoy your visit to our Wagon Wheel Information and History page. Yesterdays Wagon Wheels Handmade Today In America, we manufacture our products, we do not have a retail store, all of our products are sold via the internet. Please contact us before you plain a visit. Should you have questions concerning any of our services or products, Please Contact Us.